Anna Funder‘s Stasiland, which won the Samuel Johnson Prize for Non-Fiction, is one of those books that can be reviewed from multiple angles, and I know that when I get to the end of this review I’m going to be sorry about the angles I didn’t get to discuss. But, I can only do what I can do, eh? I found it interesting to read this book immediately after another non-fiction book, Brenda Niall‘s biography True north, because the contrast clarified for me why I liked True north but loved Stasiland. To put it simply, True north is a well-written but pretty traditional biography, while Stasiland is what I’d call “literary non-fiction”. In other words, in Stasiland, Funder uses some of the literary techniques – relating to structure, voice and language – more commonly found in fiction to tell her story. It’s not surprising really that this is the case, because when I heard her speak last month, she said that she had initially planned to write Stasiland as a novel but, having done the research and interviews, it “didn’t feel right” to turn those people’s stories to another purpose. She was also aware that there were things in these stories that might not be accepted, that might seem too far-fetched in fiction! Such is the fine line we tread between fact and fiction. The romance comes from the dream of a better world the German communists wanted to build out of the ashes of their Nazi past; from each according to his abilities to each according to his needs. The horror comes from what they did in its name. Seeking: former Stasi officers and unofficial collaborators for interview. Publication in English, anonymity* and discretion guaranteed. This is, depending on how you look at it, either a very brave or naively silly thing to do. Funder, who sees writing as an act of empathy or compassion, interviews several Stasi men who answer her ad, as well as other East Germans who suffered at Stasi hands. It might be coincidental, but essentially all her subjects who suffered were women, while the perpetrators were men. In fact, when she visits the Stasi HQ in Berlin, she’s told it only had toilets for men! All this is not to say, however, that men didn’t suffer (or, even, that there weren’t women perpetrators). Indeed, some of the Stasi men she interviewed were themselves bullied, blackmailed and otherwise stood over to keep them in line. What makes this book compelling are the stories she gathers, partly because the stories themselves are powerful and partly because of Funder’s own voice. Funder places herself in the book. This is not a third person “objective” recounting of the interviews she conducted but a journey we take together to find some answers. When she interviews Herr von Schnitzler, who hosted the Black Channel, a television program in which he presented a Communist commentary on excerpted programs from the West, we are in the room with her, hearing not only what he says, but getting a sense of his personality alongside her. We see her being fearless in sticking to her questions in the face of a man who frequently shouts. “I recognise”, she writes, “this pattern of unpredictable shouting followed by bouts of quiet reason from other bullies I have known”. you see the mistakes of one system – the surveillance – and the mistakes of the other – the inequality – but there’s nothing you could have done in the one, and nothing you can do now about the other … and the clearer you see that the worse you feel. I look back at him. I feel my eyes too, getting wider. How can you resist a writer who tells a story like this, who shows without telling exactly what is going on, who can inject sly touches of wit and humour into the tough stuff? I can’t possibly relate all the stories – many quite horrendous – in this book. All I can say is that it is a book that manages to show how history writing can be intimate while at the same time conveying facts and hard truths. It is a memorable book, and worth reading if you have any interest at all in politics and human behaviour. * I’m intrigued by the promise of anonymity because it seems that in some, if not in all, cases, real names are used. I presume the people involved agreed to this. Oh I’m glad you agree Tony. Not having read All that I am, I can’t comment on a comparison between the two, but I guess right now, given Stasiland has been around for a long time and that All that I am has garnered prize and after prize, that it’s All that I am that people will read! I hope though that it inspires them to pick up Stasiland if they hadn’t read it already. Tony, I’m with you. I thought ‘All That I Am’ was very ‘ho hum’ and if not for this review I would probably not pick up another Funder book in a hurry … I just might now! I think you should Justine … I haven’t heard a word against it! No, ‘Stasiland’ seems to get unanimous praise, but ‘All That I Am’ has far too many critics for a book which was supposedly the best work of fiction in Australia last year. Interestingly, Gillian Mears’ Foal’s bread is running almost neck and neck with All that I am in the awards stakes this year. I keenly wait to see who wins – if either of course – wins the next one. I liked it Tony … But we don’t always agree so will just wait to see if you get around to reading it! What an amazing review – I read Anna Funder’s All That I Am earlier in the year and loved it. I need to move this one up closer to the top of my tbr pile. Thanks Sharkell … I read this with my reading group. We tossed up which one to read and decided to read Stasiland but some have read All that I am. I’m keen to read it too but I’ve been wanting to read Stasiland for the longest time. It’s a fantastic book – and I’m not ashamed to use such superlatives. Terrific review, Sue. I think that I enjoyed both Stasiland and All That I Am equally, even though they are in different genres. Thanks RJ. You’ve probably reviewed Stasiland on your blog? (Or did you read it before you started blogging? I shall pop over to look). Thanks for the comparison with All that I am … I am keen to read it. Oh thanks Stu … I thought of that film quite a lot as I was reading the book. It was a great film and the book works well in the same context because Funder writes with a great deal of humanity, even with the men who seem totally unrepentant, because she wants to understand and she also recognised the dream (albeit their misguided way of tying to implement it). This sounds like an intense and really interesting book. Going on my library list right now! I am so glad you’ve reviewed this, I read it before I started my blog and thought it was brilliant. I’ve been waiting for someone to write a really good review of it so that I can link to it in my review of All That I Am (a book which, for all its prizes, I am ambivalent about). Thanks Lisa … It’s a great book, isn’t it, and she’s an interesting woman. I’m hoping to get to read All that I am soon … But who knows. The books are piling up! No, I hadn’t Tony. Will check it out. Thanks, Tony, I hadn’t, but I have now – and will link to it on my blog as well. BTW I am writing this from Berlin, where today we have visited The Wall and Checkpoint Charlie – and been NOT served by the rudest waitress I’ve ever come across – who was obviously trained on the wrong side of the wall! Oh dear … But how great to see those places. Have been to Germany … Before the wall came down … But not to Berlin. Odd coincidence, I just started reading this. Slightly underwhelmed by descriptive phrases like ‘loud makeup’, which seem more judgmental than evocative, not to mention the startling and rather disloyal ‘I remember my mother’s moustache in the sun’, but will press on. I’ll be interested in what you think by the end, zmkc. “Loud makeup” didn’t bother me … I don’t particularly recollect it. I do recollect the mustache though. Being related to a writer requires a thick skin I think. I wonder if ten years later she’d still say that. Basing a mother I agree in principle zmkc! But that was pretty minor in the scheme of mother abuse methinks. Now Jill Kerr Conway in The road from Coorain is a whole other matter. 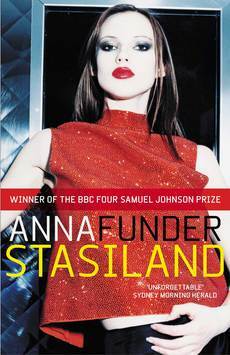 Paul, Anna Funder wrote a great non-fiction book entitled Stasiland . She spent time in (former) East Germany, finding out about the Stasi (the secret police during the Cold War). Very, very fascinating stuff.Apparently she wanted to write that one as fiction, but it worked better as non-fiction. I think it wouldn’t have been believed if it was fiction! Anyhow, I found it fascinating, and it was quite at the forefront of my mind when I was reading Le Carre’s Smiley novels earlier this year. All That I Am is about the people who resisted Hitler, from what I’ve read. One of those that’s partially set here and now (literally for me, the first chapter is set in Sydney and I kept on recognising places!). And with this structure, it’s a relief to know that at least one of the characters will survive WW2.